Google Play Store has plenty of music streaming apps. Due to legal issues in music streaming space, not many Internet Radio apps survive for long term. For this reason a lot of these apps are premium only. However some Radio channel apps are released in Free version as well. In this article, we review some of the best Free Radio Apps for Android Platform. It's not hard to find free Internet Radio app on Google Play store. However, not many of such apps cover multiple genre in their playlist. So choosing the right app that allows control over searching for radio channels is not that easy. Here are some of the free Radio channel Apps for Android that allow you plenty of radio content with more control. This app hosts plenty of private radio channels. The channels hosted by this app are only accessible through their own website and app. The free users get access to the radio channels with sponsored ads for upto 30 minutes. However in future they may force the free users with limited airtime due to increasing broadcasting fees in USA. This app has some of the best Radio channels in Electronica genre. You get access to top DJ's and their podcasts and shows through this app. If you're into Electronica Music Genre with leaning interest in Trance, House and Ambient music, then this is the app you need. The premium plan for this app is not much expensive for regular listener. It only costs 60$ per year for access to the premium electronic radio channels. If you find this too expensive then you can stick to the free access. Another radio channel with access to both local radio channels and web based radio. It has wide range of channels from many genres. It also includes the podcasts in politics, comedy and business. It has managed to run as an app free by running the airtime radio ads. In future they may either ad in-app ads or the subscription option. The user interface of the app is really smooth and makes it easy for us to filter and navigate the music. The recent update in the app includes the Material design view and support to the SmartWear and Chromecast. If you are looking for premium radio channels in variety of genres at a free of cost then this is the app worth checking out. Google has kept access to the free music with their YouTube app. The new features of finding music channels and content is now possible with YouTube Music app. This app let's you search soundtracks from many genre. It also has cheap subscription plan depending on your requirement. However the subscription is limited to some of the countries as of now. If you are browsing behind the VPN access, you can make use of this app to listen to some channels. In future this app may accept many Asian and European countries through their Google Pay system. 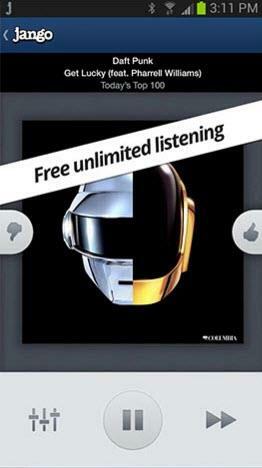 Till then you can listen to free music using their app. Another radio network with vast array of Free and Paid Radio channels. The amount of variety in the network will make you upgrade your subscription plan. It covers many regions and localized radio channels. 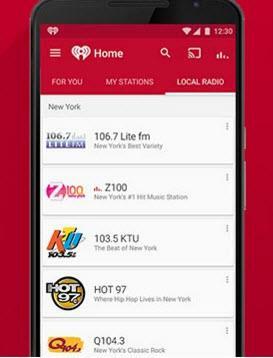 It has both free and private radio channel subscription access through their app. The app has access to 100,000 stations that you can try depending on the genre and language of your choice. The free version itself is more than enough for the regular listening. It doesn't have much restrictions like other Radio apps. However, if you want audiobooks, podcasts and access to private radio channels then you may benefit from the subscription. The app offers in-app purchase, or you can login to their website and subscribe through it and then let App sync the updates. The only radio app that supports offline playback option. This app allows you to record any radio session up-to specific limit and then you can use the playback feature. The app also has access to plenty of radio channels within their network for Free users. It has many advanced options for navigation and filtering in their pro version. Though this app has limited private radio channels and common radio content is also found in most other radio apps. This is the reason they are not much popular in the music streaming community. The app has in-app purchase option for subscription and you can also subscribe from their website itself. The paid access gives you live streaming of private radio and some other popular podcasts. This app focuses more on indie music space. So any independent music that doesn't have mainstream focus gets featured here. So the radio channels in this app have less popularity. However there are some popular free radio channels included such as 1.fm and Di.fm. Depending on how much you find the private radio content useful, subscribing can be a good option. There are some ads being added within the stream. This also includes sponsored songs from Artists. That's how the Jango is operating it's free app for some time now. The app is good for those who want to listen to the indie music from various genre. There are many other free and paid radio channel apps on Google Play Store. Depending on your interest and regional content choice, you can check out some of the above Apps for the free Radio content. If you like listening to international mainstream music from variety of genre, then the above apps in the list are worth checking out.